AMC-20 Mobile Cart | Aseptico, Inc. The AMC-20 from Aseptico allows any workspace to become a fully functional dental operatory in a matter of seconds. Features include self-contained air, water, and vacuum systems that eliminate the need for on-site plumbing or a utility room. 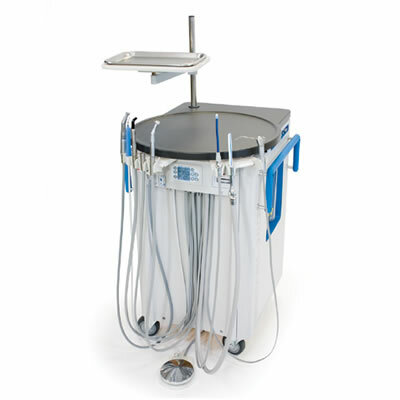 The automatic liquid waste purge and handpiece flush system provide improved infection control. The AM-20 sports ample counter-top work surface and large casters for easy mobility between operatories or within the facility. The unit is fully compliant to current regulatory and electrical safety standards. It has movable holder arms for convenient positioning of handpieces and suction instrumentation, as well as a dual-voltage option available for 220 V operation. AMC-20 has a 2-year equipment warranty.